He was named Omnitron back when I made him up in the late 1980's but I've had to change his name. Omnutron came from a bunch of random attempts to make a new-but-close name. Omnu turns out to be a prefix in the Ido language that means 'everyone' which luckily fits a few things in his backstory. 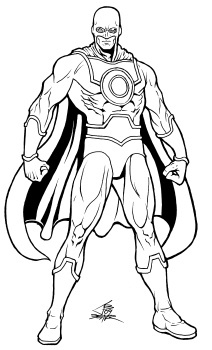 His outfit has constantly changed over the years but the main constants have always been the full cowl, a circle on his chest (which gives him his powers) and the cape. He's the 'Superguy' analogue in the Golden Age of my main comic universe but he was a mix of both the Superguy and a certain patriotic captain BEFORE those two were mixed by their actual companies. He used to have the Cap-style buccaneer boots and gloves but what I've given him here makes for a much better spaceman look.